Send your reviews, pics and memorabilia to the dpas mailbox! They all came out to Rama, on the Lake Couchiching shoreline... with a 36 piece symphony orchestra as "... .the new hook to hang their coats on." The first thing that struck me was how little room the band had to move around onstage. That must sap their energy level a bit. Highway Star was in it's rightful place as the show opener and set the tone for the night. Rockin'. Early on, Ian Gillan told the crowd " Nick Fyffe is not available tonight, we are pleased to have the services of Roger Glover". I thought the orchestra worked well, especially on Perfect Strangers, Rapture of the Deep and The Well Dressed Guitar. . Hard Lovin' Man was an awesome, heavy, unexpected treat !! The set list was, as always, heavy on Machine Head, but we knew that would happen. Gillan was in good voice for the most part. I noticed that Woman from Tokyo and Knocking at Your Backdoor were tuned down a full step, no doubt cuz he has trouble with the original key . No disrespect to the man, it is what it is. They really should retire Space Truckin' though. The "yeah, yeah the freaks said,... music in our solar system " verse is too much for Ian nowadays. There was a major pile-up comin' out of the the singalong chorus of Smoke on the Water. I think the lack of response from the audience made Steve go back into the riff before the rest of the band / orchestra. Christ, what a sleepy crowd!! I wasn't feeling any "great vibes" from where I sat. That said it seemed to be hot and hoppin' down in front of the stage. I'd give last night's show a 9/10. Since Canadian stops have been so infrequent in recent years, if it's Purple's last show in our neck of the woods, they went out on an "up" note. Set list: 1. Highway Star / 2. Hard Lovin' Man / 3. Silver Tongue / 4. Strange Kind Of Woman / 5. Rapture Of The Deep / 6. Woman From Tokyo / 7. Contact Lost - Steve Morse Solo / 8. When A Blind Man Cries / 9. The Well-Dressed Guitar / 10. Knocking At Your Back Door / 11. Lazy / 12. No One Came / 13. Don Airey Solo / 14. Perfect Strangers / 15. Space Truckin' / 16. Smoke On The Water. Encore : 17. Hush / 18. Black Night. "Silver Tongue" was played in place of "Maybe I'm A Leo", which was performed in Rama. "I knew it!!!.. .having seen the reserved crowds in Rama (Toronto), I knew the Montreal crowds would be more vibrant! Prolonged stand ovations after Strange Kind of Woman and Perfect Strangers to name just two! Gillan's voice sounded a bit better especially with the high notes, but then again Salle Wilfrid Pelletier was built for orchestral sounds so EVERYTHING sounded better. The orchestra was really present throughout the show. The songs were the same with a few changes to intros ( Steve’s` guitar “greatest hits” intro to Smoke on the Water is back!!!..yaaaa!) and Don`s intro to Knocking` at your Backdoor was slightly different but this added to the great atmosphere. What a great show and we can only hope they will come around real soon!!" 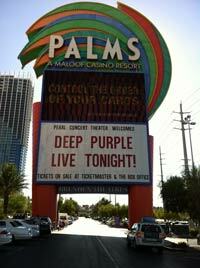 "For the fourth time since 2004, Purple's US tour included a stop at this US gambling destination. I've seen all four shows, and was lucky enough to meet the band after a show in 2005. Nice guys, all around, as we all know. I'm not a fan, however, of rock acts at casino showrooms. Venues designed for Michel Buble or Vic Damone don't always lend themselves acoustically to rock acts, and unfortunately, the stop at the Trop was no different. The showroom seats about 3,500 to 4,000 people, and it seemed pretty full last night. It was hard to tell how many were gambling comps but looking at the crowd, I wouldn't guess there were that many. Ages ranged from about 12 or 13 to us greybeards. The "orchestra" was set up on risers behind the group with a conductor podium right at mid center stage. After a brief orchestral overture, the guys wandered out almost nonchalantly and kicked off with Highway Star. Set list: Highway Star ~ Hard Lovin' Man ~ Maybe I'm a Leo ~ Strange Kind Of Woman ~ Rapture Of The Deep ~ Woman From Tokyo ~ Contact Lost - Brief Steve Morse Solo ~ When A Blind Man Cries ~ The Well-Dressed Guitar ~ Knocking At Your Back Door ~ Lazy ~ No One Came ~ Don Airey Solo ~ Perfect Strangers ~ Space Truckin' ~ Smoke On The Water. Encores: Green Onions (! )~ Hush~Black Night. The show lasted a full two hours. The crowd was attentive and appreciative, but fairly reserved. However, the room just doesn't lend itself to standing in the aisle and whooping up and down - the seats are narrow, close together, and there's really no place to stand up and shout, if you know what I mean. Gillan spent almost no time between songs with any patter with the audience - which may or may not be a good thing, depending on your outlook. Roger seemed to be having a good time, and Paicey did his usual top-notch job. Don had a small Hammond, (conspicuously, NOT Jon's old warhorse), an electric piano and a synth of some sort. Steve switched guitars after nearly every song and was playing through just two small speaker boxes. A far cry from banks of Marshall stacks! My only negative about the show was the orchestra. To tell the truth, it seemed pointless. They 'played along' with nearly every song, but the audio mix was horrible - only Roger's bass came through distinctly. Very few of the vocals were understandable at all (luckily, some of us knew ALL the words..LOL) and Steve's guitar was hopelessly muddled. Nothing the orchestra did really added to the show - it was a 'greatest hits' show with the audio quality of a 20 year old cassette tape that had been left out in the sun too long. It was disconcerting as well to see trombone players and a guy with a french horn with headphones on. Just didn't work. I think it could have been much more unique if the orchestra was given actual scoring to play either as intros or cadenzas for some songs, rather than just 'strumming' along like a rhythm guitar. I actually saw one of the percussionists tapping a bongo. The highlight may have been during Hush when a young lady who'd probably had a few too many free cocktails slithered up on stage, and put big Ian into a bear hug. He boogied with her for a minute or two and then gently walked her back to her friends and tried to help her off the stage - but she was not having any of it. Finally a stage hand came over and very politely maneuvered her off stage. All in all, it was perhaps the most calm and charming 'stage eviction' I've ever seen, and considering Ian's past run-ins with event security, quite humorous." 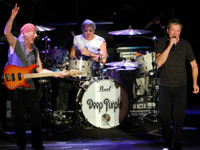 "Always so much fun seeing Deep Purple in my hometown of Atlantic City. We (wife and I) stayed at the Tropicana and met up with some old friends and made some new ones at one of the many bars during considerable pre-show libation. I have lost count of how many Purple shows I have been to in the last thirty years or so, well into the twenties, and have gone to at least the last ten thinking this may be my last time seeing them. If this was in fact the last time it will go down as one of the best for several reasons, not the least of which was the front row center seats courtesy of a friend at the Trop. Of course, having gone to so many shows I was worried sitting so close, as my ears are usually ringing for days after a Purple show no matter where we are seated. We even brought ear plugs along. I am happy to report they were not needed at all. The sound was incredible and not at all ear shattering.. I think this may contributed to 1) the excellent acoustics and sound design at the Trop, 2) the amps were set far back on the stage, and 3) not as much wattage because of the orchestra. We heard avery instrument with amazing clarity, as well as Ian's voice (at least when it is not turned down intentionally). If there was any problem, it was that because we were so close and not really hearing the house PA, we did not hear the orchestra as loudly as others sitting in the back. As for the show itself, the set list was the same as with previous shows. We here in The States have come to accept the fact that we are basically going to get the greatest hits package here. Its a shame they did not do some more deeper tracks which would have really lent themselves to an orchestra ( FOOLS, and SOMETIMES I FEEL LIKE SCREAMING come to mind). That said, personal highlights in terms of the orchestra accompaniment were RAPTURE OF THE DEEP, PERFECT STRANGERS, and KNOCKIN AT YOUR BACK DOOR. Some songs like LAZY and NO ONE CAME, though performed brilliantly by the band, seemed to have the orchestra thrust upon them unnecessarily. However, as always since the addition of Steve, the band seemed to be having a great time and really played great. And once again my only complaint will be the lack of a true Ian Paice drum solo. BTW, another highlight of the show was a 50 something woman crawling on stage, walking over to big Ian, hugging him and rubbing him pretty much all over. Ian calmly walked her back to the edge of the stage and helped her into the arms of security." Thank you for the many and varied reviews of this show! SImon has others for inclusion on the DPAS Blog and in the next Darker Than Blue magazine. "Went to Bethel Woods on Sunday 12th June. 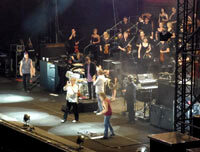 Deep Purple were great, and the orchestra added a lot, especially during Perfect Strangers. The problem was the crowd, or for a better word , the lack of a crowd. I'm 52 and I've been to many shows, 110 in 1977 alone. A long time ago I know. This place was half empty. No one stood up at any time except for Smoke On The Water and when the band returned for the encore. Ian always says the vibe the audience gives gets the band more into it. Well Dressed Guitar was less than one minute old before Steve broke into Smoke On The Water. I live closer to New York City than Bethel, but I thought I could get a better ticket for a cheaper price, which I did, but the crowd or lack of one REALLY hurt the show. Maybe I'm A Leo was great along with No One Came and a few others..., but No One Came shouldn't be about the audience. I did manage to get a great drum lesson with binoculars on Paicey all night!" "This was Deep Purple's first performance in the Minneapolis area since 2005 when the band played a free concert in front of 30,000 people at the Taste of Minnesota in St. Paul. Today's show took place at the Orpheum theater, a theater once owned and renovated by Bob Dylan. The venue was a perfect fit for a symphony backed Purple. I was in the third row, the sound was incredible and loud. Gillan was wearing white sneakers, unlike the barefooted screamer the U.S. saw the last time Purple was in the States. Several members of the symphony were handing out ear plugs in the middle of the performance. The backing violinists were laughing and singing along with several songs. Highway Star first, followed by a miniature gong wielding Gillan, tapping or should I say gonging, the instrument in the middle of Hard Loving Man. The orchestra really complimented Rapture of the Deep, Knocking on Your Back Door and Perfect Strangers. I can't imagine these songs without the orchestra. The conductor's violin solo during Lazy stole the show. 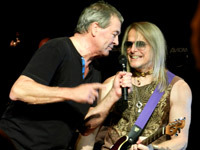 Gillan and Morse rocked back and forth together laughing during the Woman From Tokyo bridge; Gillan winking as the symphony added extra power to an already rocking tune. Gillan at times appeared to be whispering his yells. He held the microphone further from his mouth during the screams. Gillan's voice was strong, not damaged, but he was holding back, perhaps because it was the third show in three nights and he needs to save his voice for the rest of the tour. Space Truckin and Smoke on the Water saw the crowd, who were on their feet throughout the entire show, really go crazy with fists pumping in the air and several people rushing the stage forcing the laid back security to politely ask them to clear the aisles. On top of all of this was an amazing light show. Although there were some empty seats, the show was well attended by an enthusiastic crowd. A ton of tour shirts were bought and worn by the crowd that ranged from 7 to 70. There definitely were several teenagers accompanying their dads to this Father's Day show. These theaters are perfect for Deep Purple. Let's hope they return soon. " 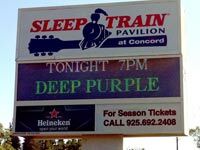 "I've been a huge Purple fan since 1977, but for one reason reason or another I'd never seen a live show--until, finally, last night. So I was really stoked. My son and I (it was Father's Day) were in the 3rd row of the balcony toward the left (Roger's side of the stage). Seemed like a great spot to observe the spectacle. I knew that realistically it would probably just be an average performance, but that would it still be a great night. Unfortunately, I can't say whether the performance was good, bad, or middling, because the sound was just dire. Gillan was barely audible for the first few songs. Hearing "Hard Lovin' Man" was bizarre. I knew the set-list, so I knew what song it was meant to be, and of course I could see the guys playing. But it was very hard to interpret what I was actually hearing as what I knew I should be hearing. (In fact, for the first twenty seconds or so I wondered whether it was a new song!) Other songs were recognizable, but that's about all. It could've been anybody playing them. Every lick in the whole show, whether from Steve or Don, was either inaudible or just sounded like generic guitar or organ sound. The only mid-song guitar solo whose individual notes I could make out was the one in "Highway Star", and I knew in advance what Steve was going to play. Don's playing was only clear when he was literally playing alone. For someone like me, who loves Purple mostly for its instrumental and vocal virtuosity, this completely ruined the show. Only Paice's drumming came over loud and clear, but of course I was getting some of that acoustically. I fear the orchestra made matters worse, since part of the sonic mush may have been the amplified orchestra. The sound may well have been terrific down in the stalls, but if the band is wondering why audiences aren't very responsive, then one of them needs to get up in the balcony and take a listen while the others are playing. Ian and Roger did a combined drum and bass solo in the encore, and it really worked. Otherwise, very disappointing." 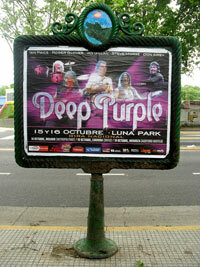 "Deep Purple missed the Northwestern United States again this tour. Living in Seattle means that if you want to see a show, you will have to travel. After learning which lucky cities were chosen, and reading snips of a possible last US tour, my wife and I decided to hit the last 3 shows (the only ones west of the Mississippi River). Show # 1 for us, Las Vegas, NV at the Palms Casino. Temp outside 108 degrees, very hot. Doors opened at 7:00pm, My wife and I were the first ones in line and first in, rushing towards the souvenir stand to buy one of every tour T-shirt and a ball cap. There were several autographed drum heads at a very reasonable price of $75.00. We were center stage, 13 rows back and the sound was perfect. The venue held about 2,500. Paicey and Don were not elevated, the stage was cramped with an orchestra behind. The lights dimmed, the orchestra started (including the Smoke On The Water riff), then Paicey, Don, Roger, and Steve came out on stage and began Highway Star - with Big Ian arriving on cue, "Nobody's gonna take my car....". The set list: Orchestra Intro, Highway Star, Hard Lovin' Man, Maybe I'm A Leo, Strange Kind Of A Woman, Rapture Of The Deep, Woman From Tokyo, Contact Lost, Steve Morse Solo, When A Blind Man Cries, The Well Dressed Guitar, Knocking At Your Back Door, Lazy (with Conductor violin solo), No One Came, Don Airey Solo, Perfect Strangers, Space Truckin', Smoke On The Water, encore: Hush (with Going Down intro), Black Night. Roger and Paicey had brief solos during the encore. The sound was great, and the show lasted a total of 111 minutes. The mixture of the band with the orchestra was spot on." "What an incredible show this was! 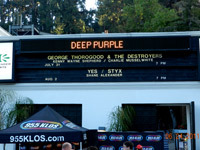 Deep Purple with a symphony orchestra at the Greek Theatre in L.A. I've seen DP many times but they were really on their game this night. Terrific audience, too, standing for most of the show. Only disappointment with the audience was that they gave up on a second encore without much of a fight. The group played for quite a while, and the solos by Don Airey and Steve Morse were incredible. This was their best show which I've seen with the current line-up. I saw them back in '72 in Anaheim, too and that had been my favorite concert until June 24th. There was a great violin solo provided by the young orchestra conductor that knocked everyone out. Ian Paice is still as fast as hell, too! Kudos to the sound crew for a great mix, and vocals that were both clear and loud enough to understand the lyrics and to hear Ian Gillan's terrific voice. The man can sing! The screaming from the old days is harder to accomplish but hey, he's not 24 anymore. He's still one of my very favorite rock singers. It was wonderful to be able to hear the nuances of his voice live. 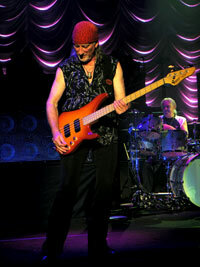 Not to leave anyone out, Roger Glover played a terrific bass, as usual. You can tell that he still loves the gigs, even though DP tour constantly. This is one of the greatest rock and roll bands of all time, there's no denying it! " "Still in awe from last night's Las Vegas, NV show, the 4 hour plus drive to Los Angeles (2 Soundboard Series shows worth), went by in no time. Our hotel was just a couple miles from the venue, the famous Greek Theatre in the Hollywood Hills area of Los Angeles, California. This was an outside venue (first time outside for me since we saw Deep Purple at Arrowhead Stadium on the Burn Tour 1974). The weather was perfect, mild 70's and cooled off at sunset. Just after sunset, the lights dim and the orchestra again started out with several snippets of songs, including Smoke On The Water. Set list: Orchestra Intro, Highway Star, Hard Lovin' Man, Maybe I'm A Leo, Strange Kind Of Woman, Rapture Of The Deep, Woman From Tokyo, Happy Birthday To You (for Steve the Conductor), Contact Lost, Steve Morse Solo, When A Blind Man Cries, The Well-Dressed Guitar, Knocking At Your Back Door, Lazy (including Conductor Steve violin solo), No One Came, Don Airey Solo, Perfect Strangers, Space Truckin', Smoke On The Water, encore: Hush, Black Night with short Paicey and Roger solo spots. The venue was larger than Las Vegas and the crowd seemed to be more into it. Ian's vocals were again right on. The sound and mix were great. This was to be the last show on "The Song's That Built Rock" Tour using the orchestra. The show lasted 112 minutes. Two nights in a row, we were living the dream, with one more to go! On our way to Concord, CA in the SF Bay Area." The weather was perfect, and this was another outside venue, The Concord Sleep Train Pavilion which is just a little smaller than the Greek Theatre. The venue was packed, even with people sitting on the lawn. Ernie And The Automatics were the opening act. Joe Satriani was the middle act, by the way, got the people awake and on their feet the entire time. Joe played for almost an hour. This was a prelude for things to come. This was really special because we were 7 rows back, in front of Steve and Ian. Again, after sunset, Deep Purple arrived on stage. What was different between this show and last nights show was that there was no orchestra. The crowd were on there feet from the start of the show until it ended. This was a Deep Purple show, Hard Rock! They played a lot harder than with the orchestra. Set list: Highway Star, Hard Lovin' Man, Maybe I'm A Leo, Strange Kind Of Woman, Rapture Of The Deep, Woman From Tokyo, Contact Lost, Steve Morse Solo, When A Blind Man Cries, The Well-Dressed Guitar, Knocking At Your Back Door, Lazy, No One Came, Don Airey Solo, Perfect Strangers, Space Truckin', Smoke On The Water w/ Joe Satriani, encore: Hush, Black Night with brief Roger and Paicey solos. What a special treat with Joe on stage with Steve on Smoke. 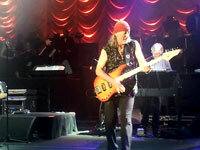 I've seen Joe several times but to see him play with Deep Purple was the icing on the cake! Once again, Ian's vocals were on fire, hitting all the high notes, and so was the mix. The band, once again, 3 nights in a row from this reviewer, sounded great." "A 5 am start and a broken foot but the prospect of an evening with legends was enough to lure us down from Scotland. 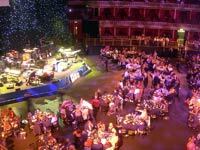 Any criticism of the event has to be tempered by the fact that it raised a lot of money for charity, but on the negative side the music did not start until after nine thirty due to the interminable auction which attracted heckles from those in the so called ‘cheap seats’. Obviously not cheap enough as the event was not a sell-out. Nevertheless, when the music did start we were treated to some great sets, highlights being Joe Bonamassa’s blues and an awesome version of ‘A Whiter Shade of Pale’ by Gary Brooker. Jon Lord was on fire for his solo set and the anticipated keyboard duel with Rick Wakeman lived up to expectations. It was well after midnight when Deep Purple came on stage and, despite the Albert Hall’s famed acoustics, the sound was all over the place with Gillan’s mike and Glover’s bass not working properly. Consequently ‘Highway Star’ was a bit of a disaster. A bit of order was restored for ‘Maybe I’m a Leo’ when Joe Bonamassa joined the band on stage but Morse’s guitar was now too low in the mix which spoilt the guitar interplay. On the positive side, Gillan was in good form now that we could hear him, and the band went into ‘Contact Lost’, ‘ When a Blind Man Cries’, and ‘Well Dressed Guitar’. ‘Black Night’ followed before the stage filled for ‘Smoke on the Water’. Unfortunately, this was offset by Bill Bailey playing the riff on cow bells. Fun for the band maybe but not for the audience who were desperate to rock. All in all an A+ for the supporting cast and a B- for the 35 minutes that Purple played. A long and very expensive outing for us and I hope the sound engineers stay off the booze when Purple & orchestra tackle the notorious Big Shed in Glasgow later this year." "My feelings echo (almost exactly) the review posted by Andrew Jones. Enjoyable and different evening, but the sound for Deep Purple was appalling. I could hear the drums no problem but the rest of the sound went AWOL, which was a shame. I could understand if it was Wembley - but the Albert Hall? One of the 'prizes' in the auction was a day drumming at Ian Paice's house!" Deep Purple set list: Highway Star / Maybe I’m A Leo (with Bonamassa) / Strange Kind Of Woman / Contact Lost / When A Blind Man Cries / The Well-Dressed Guitar / Black Night / Smoke On The Water (with Bonamassa, Bill Bailey & Jack Moore). 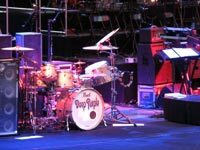 "A trip to see Deep Purple play with an orchestra in a Roman Amphitheatre seemed almost like a dream for me. I had been looking forward to this for months. The Arena in Verona is a stunning venue, the Romans certainly knew how to build a good amphitheatre! Having been in the previous day, I have to admit I was rather hoping they’d leave up the set used for Aida for the Purple concert, sadly this was not to be. A well organised venue, they even manged to cope with extending the ‘cheap’ unreserved seats on the night, and it was great to see so many people streaming in. The placed was packed and there was a fantastic atmosphere. This was the first time I’ve seen Deep Purple abroad, and it was so nice to be at an outdoor gig and not worry about the rain. The sound was well balanced with the orchestra clearly able to be heard. The band were all on good form and the orchestra added a depth to so many of the songs, particularly Hard Lovin’ Man, Knocking At Your Back Door and Well Dressed Guitar. The violin solo from the conductor in Lazy was an interesting change. Nice to see a bit of variation from the last UK tour too, with a welcome (at least to my ears) return of No One Came, one of my personal favourites. Having a hotel two minutes walk from the Arena had a couple of major advantages – one was that during an afternoon siesta we could enjoy hearing the orchestra warm up with an orchestral version of Smoke, and second was that we could hang around afterwards and meet some of the band for the first time. Thanks to Roger, Don and Steve for taking the time to talk to the fans. All in all a fantastic trip and concert, and I really looking forward to seeing them again in Manchester in November, although the MEN Arena bares no comparison to its Roman ancestor." "My wife and I booked a holiday in Northern Italy and one of her requests was to see a concert at the Verona Arena. When I found out totally by accident that the night I was in Verona Deep Purple were in town that was one hell of a slice of luck. I have been a fan since I was in short pants but my wife has different musical tastes. Still she came to the gig and was very impressed. The setting is second to none. A 2000 year old arena a beautiful summer evening in one of my favourite countries with northern Italian mountains in the distance is idyllic and certainly beats a cold night in Manchester - sat in a concrete monstrosity. The gig it’s self was awesome, the entire band were on top form. Steve Morse is a guitarist sent from the Gods - in his duet with the violinist they matched each other note to note. Spectacular. Don Airey playing in conjunction with the orchestra was again something to behold. Gillan, Glover and Paice were Gillan, Glover and Paice at their very best. The set list was excellent, although I would have preferred to have had one of classics in place of “Maybe I’m a Leo”. "Smoke on the Water", "Highway Star" and "Perfect Strangers" were my personal highlights. It was one of the most memorable gigs I have ever attended." "Well it's summer (allegedly) and Deep Purple are on the European soil again. Having been kept up to date about how good the US tour was, I decided that work could take second place. The venue is an open-air amphitheatre on the banks of the Rhine-Herne canal. The support act played a 45 minute set which really got the medium-sized crowd going. After a further 15 minutes a group of people appeared from the top of the hill, and congregated to the right-hand side of the stage. It became apparent that these people were not on the backstage tour package but were in fact the Frankfurt orchestra. They quickly took their seats and as the Conductor took to the stage they launched into an intro which included a snippet of "Smoke On The Water". Following this came the signature sound of snare drum, bass, and guitar . We were off. By the middle of "Highway Star" the orchestra had me blown away - the sound was incredible. The show flew by, the only down side being that Ian Gillian just could not carry the songs. There were key changes in most which helped him out. Steve's guitar had an aggressive sound which fitted in with the Hammond sound much better than of late, while Roger just dove-tailed into Paicey's non-stop drumming. This was an excellent show. No change in the set from the US." "The setlist : Orchestral Intro - 1. Highway Star / 2. Hard Lovin' Man / 3. Maybe I'm A Leo / 4. Strange Kind Of Woman / 5. Rapture Of The Deep / 6. Woman From Tokyo / 7. Contact Lost - Steve Morse Solo / 8. When A Blind Man Cries / 9. The Well-Dressed Guitar / 10. Knocking At Your Back Door / 11. Lazy / 12. No One Came / 13. Don Airey Solo (with some duet with the orchestra) / 14. Perfect Strangers / 15. Space Truckin' / 16. Smoke On The Water. Encore : 17. Going Down (intro) - Hush (with Ian Paice drum solo) / 18. Roger Glover bass solo / 19. Black Night - Medley (with a bit of Pictures of Home riff). The place was magical and the sound was really good ! Don Airey impressed me once again, he has really found his place in the band! Ian Paice was also amazing, his drumming was very powerful (especially on Smoke On The Water and during his drum solo) ! His performance was much better than in Paris where he had looked tired. The orchestra gave a new dimension to songs such as Rapture of the Deep, Contact Lost, When A Blind Man Cries, Knocking At Your Back Door and even Hush ! It was also nice to hear a piece of Pictures of Home in Black Night. And, listening to The Well-Dressed Guitar, I felt it was obvious that Steve wrote it to be played with an orchestra. Absolutely fantastic! Moreover, it was a really good night for Ian Gillan : he sang high notes quite easily. I was pleased to see him like that. To conclude, I had a fabulous time during the show ! 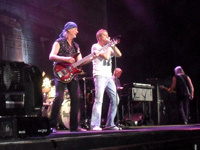 This probably would be my favorite Deep Purple show since I've known them (2006). Long live Deep Purple !" "Another great show in Brazil. I think there were about five or six thousand people in place, many seeing the band for the first or second time. The crowd was so intense that it seemed to inspire the band." " A very good show in a sold out venue. Normally in Sao Paulo the band do two shows, but on this tour there was only one. " Sao Paulo has become a regular place for Deep Purple since 1991 and they played a good show for a sold-out audience (3,000 people?) at Via Funchal. As expected, Deep Purple started with a powerful “Highway Star”, but I was particularly happy with “Hard Lovin’ Man” which followed. As expected many young fans had a cold reception for this song and other lesser known old songs (at least lesser known here in Brazil) such as “No One Came”. That’s predictable, as you must be 50+ years old to understand what these songs meant at their time. Apart from “Perfect Strangers” and “Knockin’ at Your Back Door”, more recent songs like “Rapture of the Deep” also received a less enthusiastic reception from the audience. In general, everybody wanted to hear the classics from Mk. II and Deep Purple delivered them all. In general, the show seemed to me a little "bureaucratic" but I enjoyed it. My emotion from the first appearances in Brazil is vanishing, but it’s still Deep Purple. Long Live Purple!" For the second show was decided - for some reason - to set up chairs in the stadium (which did not happen the first night) and significantly raise the entrance price for the show. " © 2011 DPAS / Darker Than Blue.